With the year of experience in this domain, we are involved in offering best quality of Glass Fiber Filter Bag. This Glass Fiber Filter Bag is extensively used for fiber bags in high temperature circumstance. Further, the offered products are known for their long functional life. Our products are of world class quality. 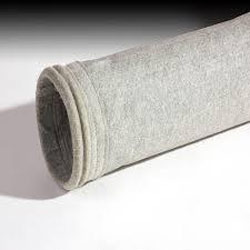 We are comprehensively providing an extensive range of Filter Bag.We use high quality Non-woven needle felt polyester and polypropylene fabrics with antistatic , anti adhesive and water repellant treatment. Also, the manufacturing process and testing process of this Dust Collector Filter Bag is done under the supervision of our experienced professionals. Price Range: Rs. 700 to 2000/Piece Note: Price may vary depending upon customer's requirements. Owing to the wide experience in this domain, we are instrumental in offering Glass Fibre Filter Bag to our clients. With our expertise and trustworthiness, we are engaged in offering an optimum quality range of Fiber Glass Filter Bag. - Have available in the triple finish (silicon, graphite & Teflon) on fiberglass dust collector bags to release easy discharge the material. - Weight: 450 gsm to 850 gsm.